Rub garlic and red pepper with olive oil and place on a baking sheet. Roast for 15 minutes. Place garlic and pepper in a plastic covered bowl for 5 minutes. Peel the skin off the pepper and roughly chop. In a blender, combine peppers, garlic, tomatoes, almonds, onion, vinegar, salt and bread until thoroughly combined. Roughly chop the spinach; place in a medium, microwave-safe bowl. Add water and cover with plastic wrap. Microwave for 3 minutes. Allow to sit in microwave for an additional minute. Drain water by squeezing the spinach. 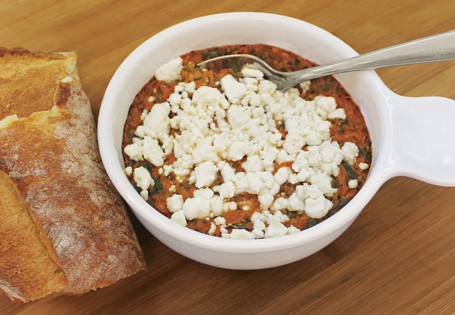 In a small baking dish, combine romesco sauce and spinach. Sprinkle feta cheese on top. Bake for 10 minutes.